Special Edition – Hello Tuesday Morning! [Click to Tweet] Happy Launch Day Rebecca’s Legacy! August 7, 2018 #NewRelease #Kindle #99¢ One day only! A 1940s historical romance – Amy Juliana Emerson might be a cultured debutante, but she’s doing her best to follow her mom’s rebellious footsteps. What will it take to teach a spoiled heiress about the greatest legacy? Amy Juliana Emerson might be a cultured debutante, but she’s doing her best to follow her mom’s rebellious footsteps. Her desperate attempt to escape her father’s control, however, comes at the worst possible time. Robert Emerson has received a threat against his family in an attempt to take over his company, Sanderson Industries. To guarantee his willful daughter’s safety, he sends her to work on a produce farm run by her Aunt Rebecca. Maybe her quiet strength and unconditional love can work on Amy, keep her from becoming the prodigal daughter she seems insistent on being. Click this photo to buy Amelia’s Legacy and Carlotta’s Legacy! NOTE: All my Write Integrity Press books are available in Kindle Unlimited. 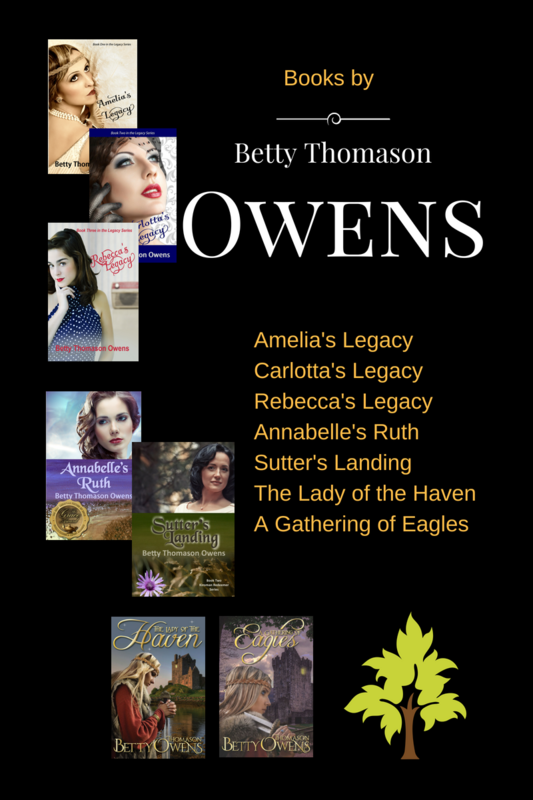 Betty Thomason Owenshistorical romanceNew ReleaseRebecca's LegacySpecial Edition - Hello Tuesday Morning! My friend Betty Thomason Owens book is now released!